We have a strict two weeks cancellation policy, guests must contact us before 2 PM ACST two weeks days before their arrival to avoid being charged. If you wish to cancel or amend your booking, please contact us. Check in is any time after 2 PM. All guests are required to provide a government issued photo ID (passport/driver’s license) along with a credit card at check in. Your nightly rate covers a stay from 2PM to 10AM the following day. Check out time is 10 AM, late fees may apply for a late check out. Please be considerate to other guests when you leave the room in the morning. We’ll try our best to accommodate early or late check ins and check outs, however we may not able to meet a certain request depending on availability. Management should be notified in advance for any extension of stay at the hostel (subject to room availability) and payment should be received before 8pm of the date of the request in order to get approval. A deposit in cash of $10/person is required upon check-in. The deposit will be returned to you when you check-out. Failure to claim your $10 deposit within 15 days after check-out will result in forfeiture of the amount. You must claim your deposit in person at our reception desk. Parking is available free of charge for all house guests. Please do not park in the way of the electrical motorized gate when fully open or half way open and on/besides the yellow line on the street as you might get fined by the Alice Springs Council Rangers. Do not leave any valuables inside your car when parked. Jump Inn Budget Accommodation cannot take any responsibility for the loss or theft of any of such articles while your car is parked. The purpose of the policy is to provide a safe and secure environment for our guests and our staff. Please have your visitors wait in the lobby area by the reception desk. Visitors or non-guest friends are not allowed inside the premises, the residence area is reserved exclusively for registered guests. Please note that unfortunately we don’t have facilities suitable for children. We can only accept guests over the age of 18. Pets are not allowed without prior arrangement/ permission from the management team. *Please note that we do not admit guests from Alice Springs or the Greater Alice Springs Area. *Smoking is permitted outside at the designated area, please use ashtrays placed in the yard. Smoking is completely FORBIDDEN inside the room. A fine of $250 will apply when smoking in the non-smoking area. 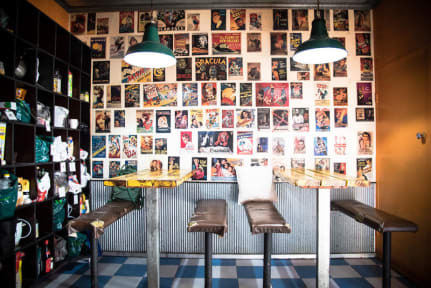 *In the event of failure to comply with the Jump Inn Alice Springs Fire Regulation, resulting in activation the fire alarm where the emergency services are required to attend: the guest will be held liable for the associated costs of $823. 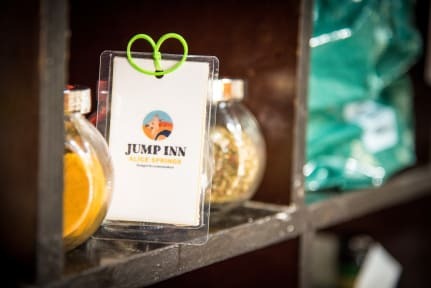 Jump Inn shall not be responsible for, or liable for any loss, theft or damage of personal property on, or brought into the hostel or in the immediate vicinity of any of the hostel. Jump Inn also reserves the right to terminate the reservation immediately if guest failure to meet the Jump Inn Guest Code of Conduct, without a refund. *The replacement cost of any damaged door lock is applicable for a total amount of $350 to be paid immediately. We accept Master and Visa cards, please note that if you wish to settle your bill by credit card a surcharge of 1.5% will be applicable. Full payment has to be made on arrival by cash or credit card. Prices quoted are in AUD and all payments must be made in AUD. *We thank you in advance for your comprehension and co-operation. Previously known as Annie's Place, Jump Inn re-opened in June 2017 hoping to create a 'home away from home' for all the travellers and backpackers staying with us. Our lovely little hostel is like an oasis in the middle of the Australian desert - come stay with us, enjoy a relaxing sleep in our brand new memory foam mattresses and chill out with a free coffee in our green outdoor area. Meet Willies and Crazy, our two lovely dogs living in the hostel. All our dorm rooms have been recently refurbished and they come with brand new mattresses, en-suite bathrooms, air-conditioning and a set of lockers to store your personal belongings. Our private rooms are perfect if you´re seeking the comfort of a private space - we have both rooms with shared bathrooms and en-suite. Free breakfast is included in the room price and it's available from 5am-9am.